Another Sunset Soiree has come and gone! What a wonderful evening with something for everyone: A great venue, good food and drink, fabulous silent auction, gift card, whiskey and wine pull items, great music and most importantly, great people coming together for a common cause – our local water! Who knew that working so hard on behalf of our area’s natural resources could be so much fun? So how did we do this year? Our net income was $23,311! — All of our Sponsors – Bass Pro Shops, Steak ‘n Shake, Youngblood Auto, KY3, Sunbelt Environmental Services, Torgerson Design Partners, Great River Engineering, Commercial Metals, Cochran Engineering, Southwest Missouri Council of Governments, Meridian Title, PCnet, KSMU Ozarks Public Radio, BWI Springfield and Blossoms Floral – for your support on a variety on many levels! — A special shout-out to our friends at Gilardi’s, Springfield Brewing Company, St. James Winery and Spring Branch Kombucha for the evening’s wonderful food and drinks! — To our pop-up art gallery artists and craftsmen Tim Breaux, Alicia Farris, Farley Lewis and Larry DeGraff who donated beautiful works of art that capture so well what we love so much about the Ozarks! Also a special thanks to JRBP Board Member Jason Frantz and Watershed Committee of the Ozarks’ own Mike Kromrey for their handcrafted canoe paddles! — To all who donated wine, whiskey, silent auction and gift card pull items! — To our band, 83 Ski Doo, for providing a great soundtrack for the evening’s festivities, and Ken Childers for being our Master of Ceremonies! — To our volunteers, who did everything from park cars, check-in guests, run the various auctions and pulls, string lights and then tear it all down again at the end of the evening. An event like this simply wouldn’t happen without your dedication and love! — To the City of Ozark, for their technical and logistical support, and allowing us to have one of the most spectacular event venues in the area! 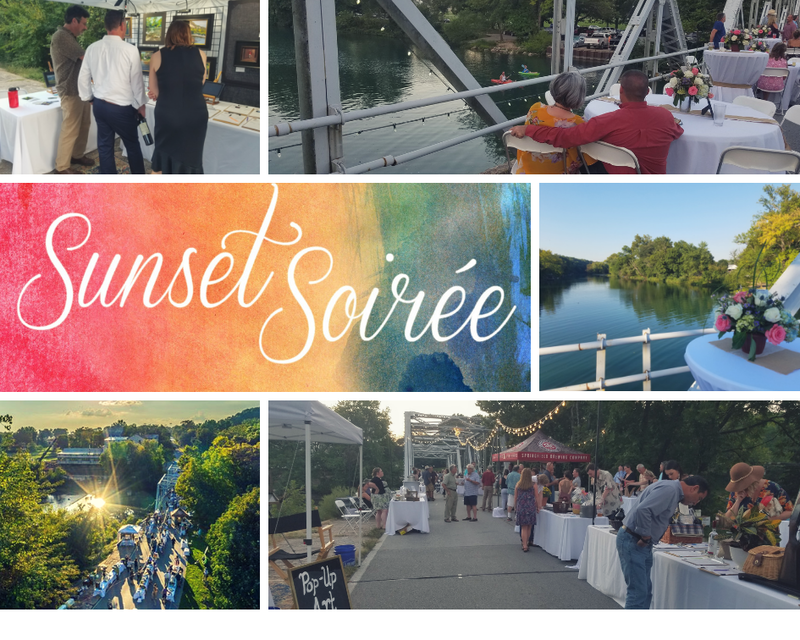 We can’t wait until next year’s Sunset Soiree – We’ll see you on the bridge in 2019!